Integrated Automation & Robotics is the prime destination for the clients for accessing the Automatic Autophoretic Coating Plants (Transporter based), which is also called as Auto deposition or A-coat. 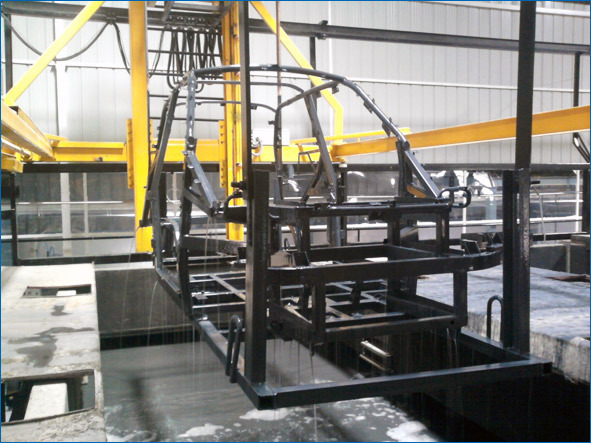 Autophoretic Coating Process is a waterborne process in which organic polymeric emulsion gets chemically deposited on the surface of a clean metal substrate. Appropriate dipping of the component & material handling. Formation of a uniform film over the entire surface of the work piece. Elimination of heavy metal waste and volatile organic compounds emissions. Improvement of inside-out corrosion performance. Easy reach even in difficult-to-reach areas. Comparatively low cost of coating w.r.t. ED coating. Defense and Machine build up industries. Heavy earth moving equipment manufacturing. Heavy earth moving equipment industry.